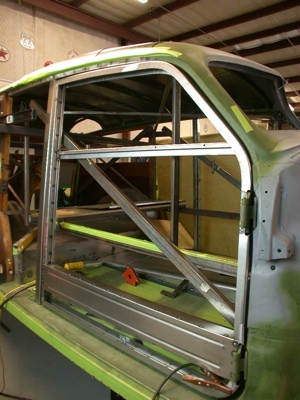 It is often necessary to build custom parts for a restoration project and this is how we built a new door frame for a 1946 "Woody". 1. We started by making a paper board template of the door opening. We will make any adjustments needed as the door progresses. 2. 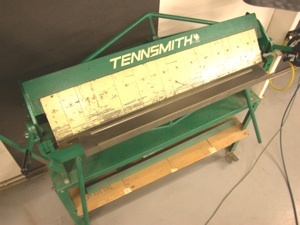 Then we took 18-gauge cold rolled steel and cut a 2-inch strip. 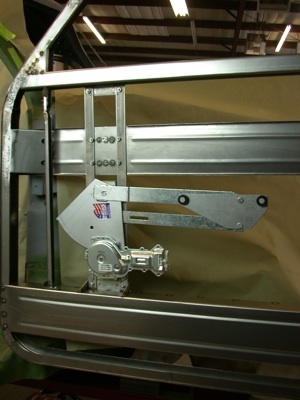 And bent it on our sheet metal brake to form a 90-degree angle measuring 1 x 1 inch. 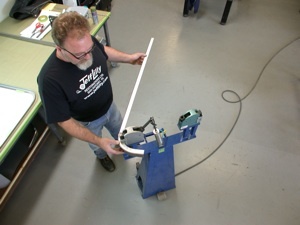 Next, using our power stretcher/shrinker we made the piece fit around the curve of our template and tweaked it to perfection by fitting it against the door opening. This is the inner section of the door perimeter. 3. 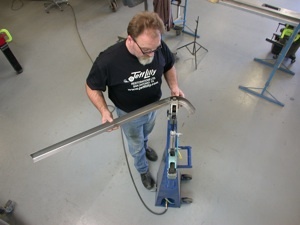 Then we bent another strip of metal at a 90-degree angle to a 1 x 2 inches and followed the same procedure to form the outer perimeter of the door. We punched holes in the inner structure along the horizontal flange for welding purposes and then we slipped the outer flange over the inner and checked for fit. This allows adjustment for the door width. 4. We laid out the pieces on a table to assure an exact fit to our template. 5. Here are the two pieces. 6. 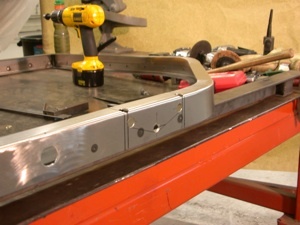 Next we clamped the inner and outer pieces together and welded through the holes we punched. 7. 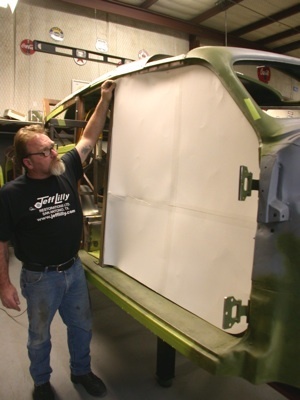 The door frame was then placed back on the car to check the fit and locate the proper hinge placement. 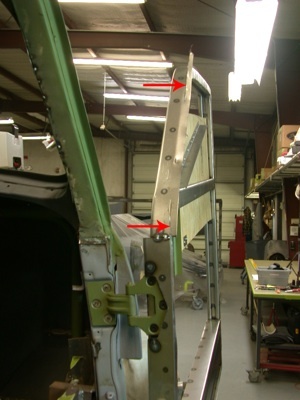 We marked it exactly at the hinge plate attaching points so we could use the original hinges. 8. After we established the hinge location we used a small hole saw to drill a radius at the corners and a cut off wheel to remove the remaining metal. 9. 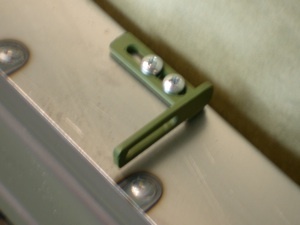 A "stair step" holder to back up the threaded fastener plate was fabricated with a front cover featuring access holes to install, remove or loosen the allen head bolts to adjust the door for precise fit. 10. 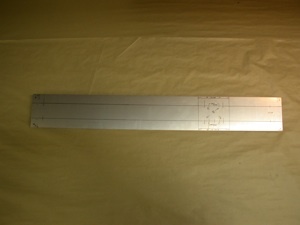 The frame was then fitted with the hinges along with the fastener plate and holder. After exact placement we welded it all in place. We now have a swinging door. 11. Next we laid out a piece of 20 gauge steel for a lower support beam. 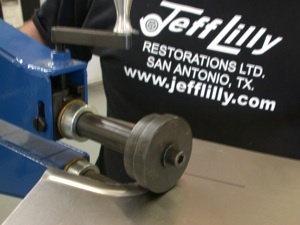 Then marked it for the bead roller to make strengthening grooves to stiffen up the door assembly. 12. 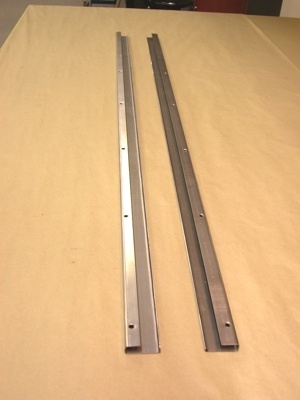 We rolled out ½ beads on the inner and outer panel using our 36-inch bead roller. Just follow the marker lines and it is done with no warpage. 13. A The panels were then bent on the brake to fit one inside the other. 14. The 90 degree lips will provide the fit. 15. Then we spot welded the pieces together and cut out the back half on each end to allow us to stitch weld them in place on the ends. 16. At this point we cut out strips of 20 gauge steel and bent them at 90 degrees. 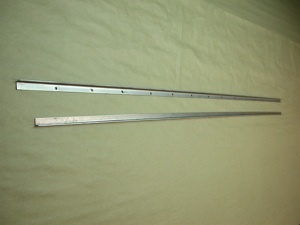 The two channels were then welded together to form the rear portion of the window channel. This is where the rear edge of the glass will slide up and down. 17. We used 1/2 inch square tubing as a form to provide the width needed for track glide material on both sides of 3/16 laminated flat glass. 18. 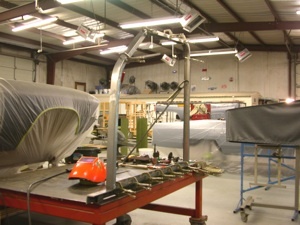 We weld it all up while clamped in place and then allow it to cool . 19. 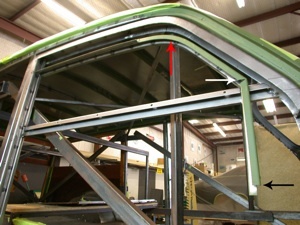 To show you the exact location we fit the channel in to the driver side rear door edge. 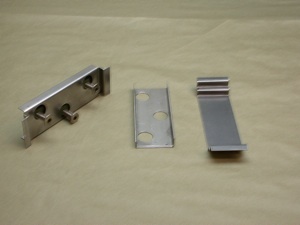 As seen it allows ample clearance for our door catch which we will mount at the end of this article. 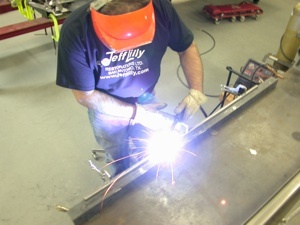 We then installed and weld the channel into our passenger side door. 20. 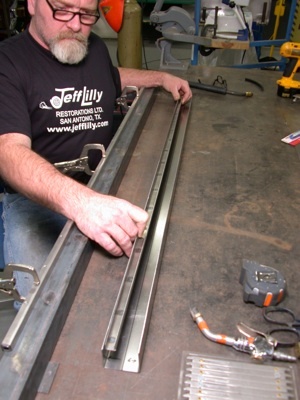 We then built channels two inches on one side,and one inch on the other. And we bent a small lip on the two inch side to support the outer door panel and inner interior panel on their respective pieces. This is the "window sill" where your arm would make contact if you had it resting on the door while cruising. 21. Then we installed the inside window sill to the door frame and tack welded it in place. 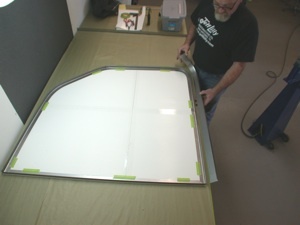 Note the holes, these will be used to retain the window fuzzys, which will also make slight contact with the glass inside and outside allowing a smooth glide against the full width of the glass. 22. 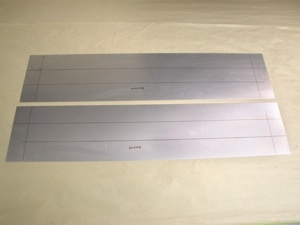 Here tested the fit of our window fuzzys and cut them to length to be sure everything works correctly. 23. 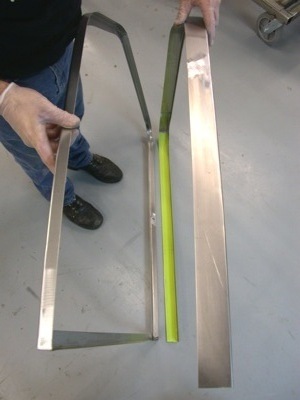 Next we built another channel and pie cut one section (white arrow) to allow our overall width of the side glass. We shrank the upper section (red arrow) to match our curved roof line and will lengthen the bottom end (black arrow) to attach it to the bottom door brace. This section needs to be removable to service the door if the power window mechanisms or glass ever need replacing. 24. We installed 3/16ths wood as our temporary glass to check our fit. 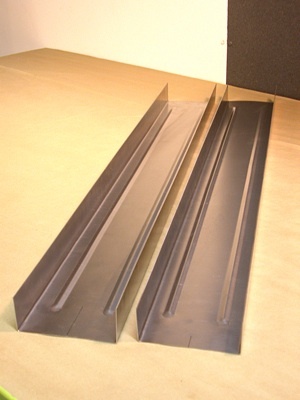 You can also use 3/16th lexan but it is more expensive. 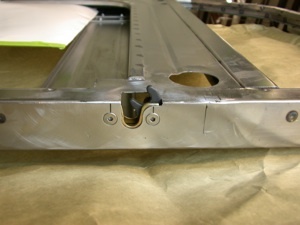 After we installed the outer window sill section we checked for proper clearance and then tack welded all the channels in place. 25. 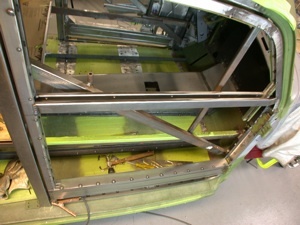 Here you can see that we welded the outer sill (red arrows) in place and then cut off the excess metal. 26. 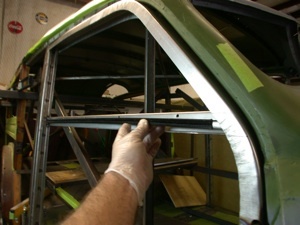 Once the inner and outer door frames were spot welded together the top window channel was tack welded on. We then slid the plywood and channel up and down to check the alignment before continuing. 27. 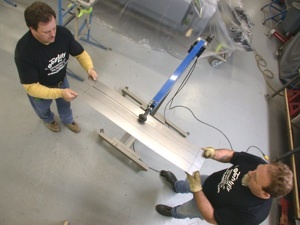 Here we laid out the metal for the upper power window motor support panel. We then drilled holes and added support plates. This will also act as a support beam. 28. 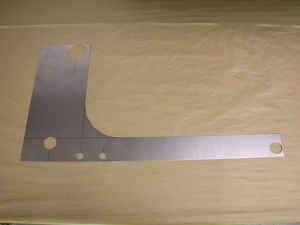 We made two plates one inch wide and 1/8 inch thick from flat stainless bars for the power window regulator. 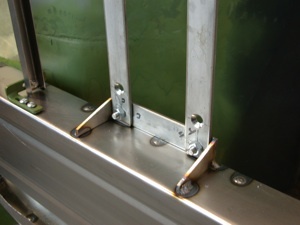 They were then spot welded to the upper support panel/beam. 29. Threaded inserts and a custom two-way bracket keep the bottom of the removable front channel discussed in step #23 in place. 31. 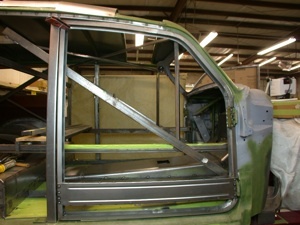 Here you can see the power window support panel/beam unit installed and tack welded on both ends. 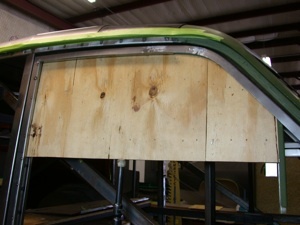 And you can see the window glide channel extension installed behind the beam. 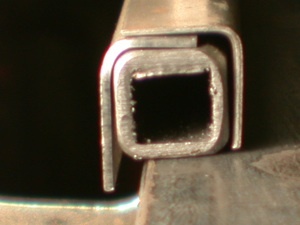 A ½ inch bead was rolled in to the panel for rigidity and the outside edges are bent on the brake at a 90-degree angle for extra strength. 32. 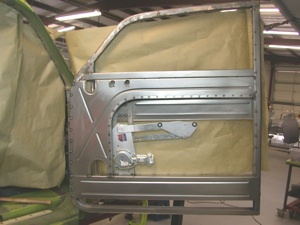 Next we installed two sections of one inch stainless strap 1/8th thick for the power window motor. 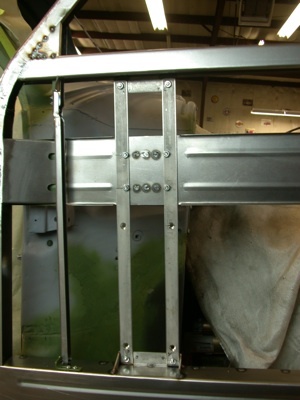 The stainless uprights attach to the upper sill top, side to side panel brace/beam and the lower main door beam. Note the counter sunk holes to hold the power window regulator in place. This adds clearance in an already confined area. 33. Then we made two stainless steel bolt plates 2 1/8 x 1 and welded them at the top window sill and lower main beam for gussets. 34. There we checked the power window motor and regulator for fit. 35. 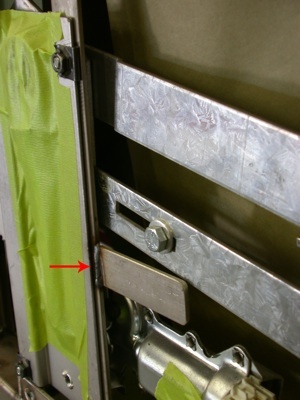 Next we welded a window down stop tab (red arrow) onto the rear upright. 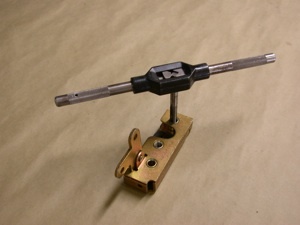 The slot on the regulator arm allows for adjustment if needed. 36. Then we cut out a piece of metal to support the door a bit more so no flex will take place when powering the window up and down. 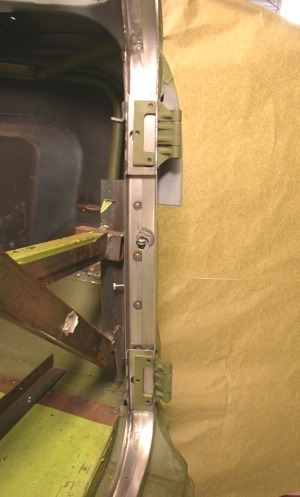 It also held the interior door-opening lever. And access holes were located in key locations for adjustability. 37. 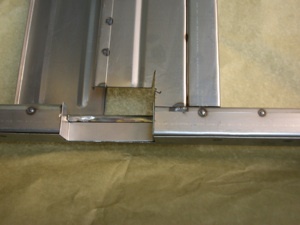 The edges of the access holes were stepped and rolled with a ½ inch bead to stiffen the panel. 38. 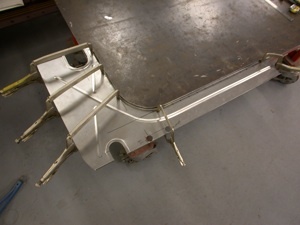 A ½ x ½ angle strip was fabricated and then fitted along the outer edge using the stretcher/shrinker and spot welded in place using clamps to complete the panel. 39. 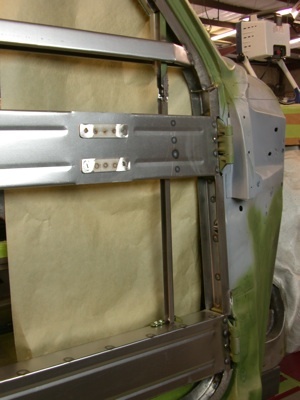 And then we fitted the inner door panel brace and welded it in place. The door is almost done. 40. 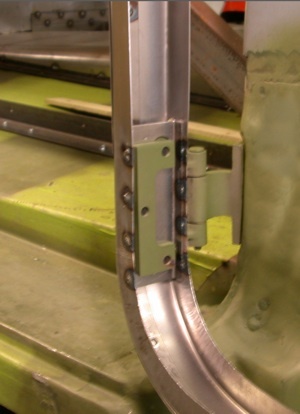 Because of the close tolerance in our door we tapped the latch mounting holes and heli-coiled them thus eliminating the need for a lock nut. 41. 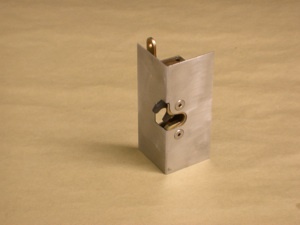 We chose small bear claw latches that included door panel corners pre-notched for the latch. 42. 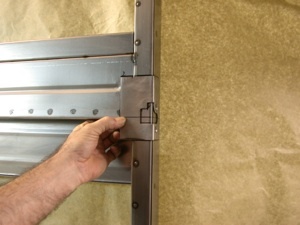 We laid out the latch location and marked it with a felt pen for installation. 43. We then cut a notch in the Rear door edge to fit the unit in. 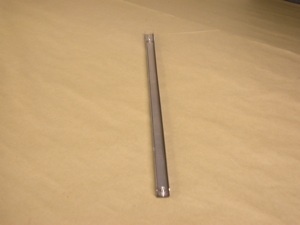 A cap was fabricated to finish off the cut out section and then welded in place. 44. 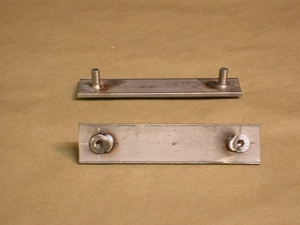 The latch plate was then welded in place and ground smooth.